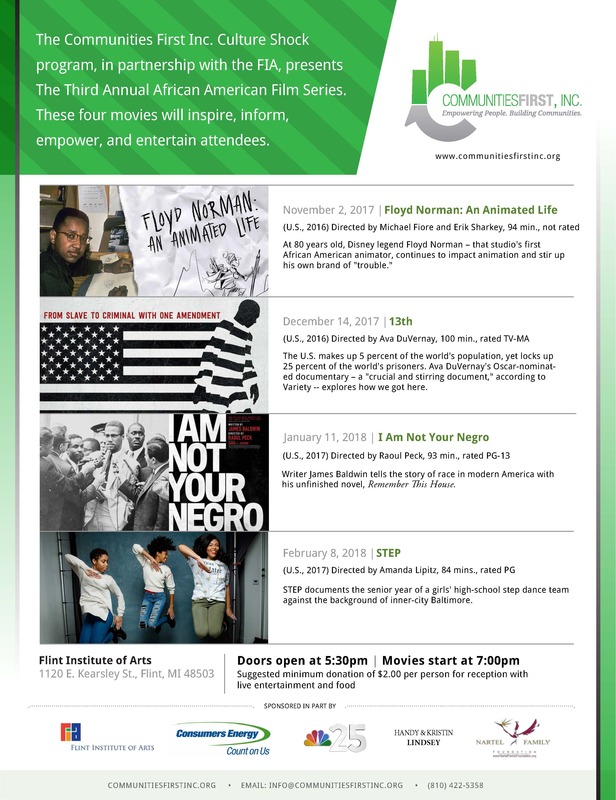 Flint, MI – Communities First, Inc. has partnered with the Flint Institute of Arts to host the third annual African American Film Series. The series is designed to inspire, inform, empower and entertain attendees. The series kicks off on November 2 at 5:30 pm. “This film series has been instrumental in opening up a dialogue about family, community and current issues in our society. We are excited about this year’s series and look forward to sharing these fantastic films with area residents. This event is for anyone and everyone who is looking for a great event with delicious food, great people and interesting films,” said Glenn Wilson, President/CEO. The series takes place once a month from November to February and is sponsored in part by Nartel Family Foundation, Genesee Health Systems, Consumers Energy, Molina Healthcare, Hamilton Community Healthcare Network and Media Sponsor NBC25. “We are happy to be partnering with Communities First to be bringing quality cinema on a variety of themes and issues to the Flint community,” said Ed Bradley, associate curator of film at the Flint Institute of Arts. Doors open at 5:30 pm and the films begin at 7:00 pm. Seating is limited to the first 300 guests and there is a suggested donation of $2 per person. Following each film, there will be a brief discussion about the themes in the films. For more information visit communitiesfirstinc.org. Reception and live entertainment begins at 5:30 p.m.
At 80 years old, see how this Disney legend, the first African American animator at Disney, continues to impact animation and stir up his own brand of “trouble.” The film is not rated. For more information about the film click here. In this thought-provoking documentary, scholars, activists and politicians analyze the criminalization of African Americans and the U.S. prison boom. TV-MA. Writer James Baldwin tells the story of race in modern America with his unfinished novel, “Remember This House”. Rated PG-13. STEP documents the senior year of a girls’ high-school step dance team against the background of inner-city Baltimore. Rated PG. For more information about STEP click here.